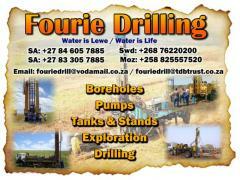 We basically focuses on ground water exploration & development. 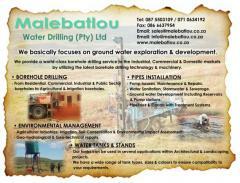 We provide a world-class borehole drilling service to the Industrial, Commercial & Domestic markets by utilizing the latest borehole drilling technology & machinery. - From Residential, Commercial, Industrial & Public Sector boreholes to Agricultural & Irrigation boreholes. 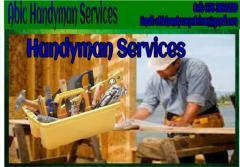 - Pump houses, Maintenance & Repairs. 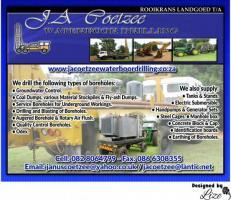 - Water Sanitation, Stormwater & Sewerage. 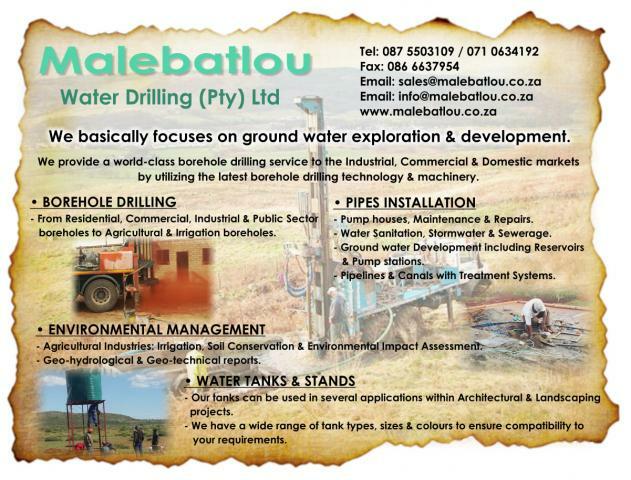 - Ground water Development including Reservoirs & Pump stations. - Pipelines & Canals with Treatment Systems. - Agricultural Industries: Irrigation, Soil Conservation & Environmental Impact Assessment. - Geo-hydrological & Geo-technical reports. - Our tanks can be used in several applications within Architectural & Landscaping projects. - We have a wide range of tank types, sizes & colours to ensure compatibility to your requirements.